Going through idea iteration to find the final idea that is an improvement on the first idea. The Dissertation at the end the of my degree has been a source of joy and stress since my first year, I was thinking then what would I want to write about and how would I even start. With several ideas rolling around my head I thought I would never choose, over the summer I did choose but I soon realised that I may have either a) bitten off more than I can chew or b) have found a topic that I could talk too much about. In the past few weeks it has mutated again and I am almost feeling like I am back at square one, as the one thing I keep being told at Uni is that the Dissertation is supposed to be a piece of writing that proves you can synthesis information from different sources and present them together in a cohesive argument. A good night’s sleep does wonders, as does a good cup of coffee in the early morning sun coming through the kitchen window. I ended up sketching out in pen and idea about how to solve some of the design issues with the character, I am still not sure about the horns, but the body is now more in keeping with the rest of the design and the legs work a lot better. Quick sketches done during my morning coffee. 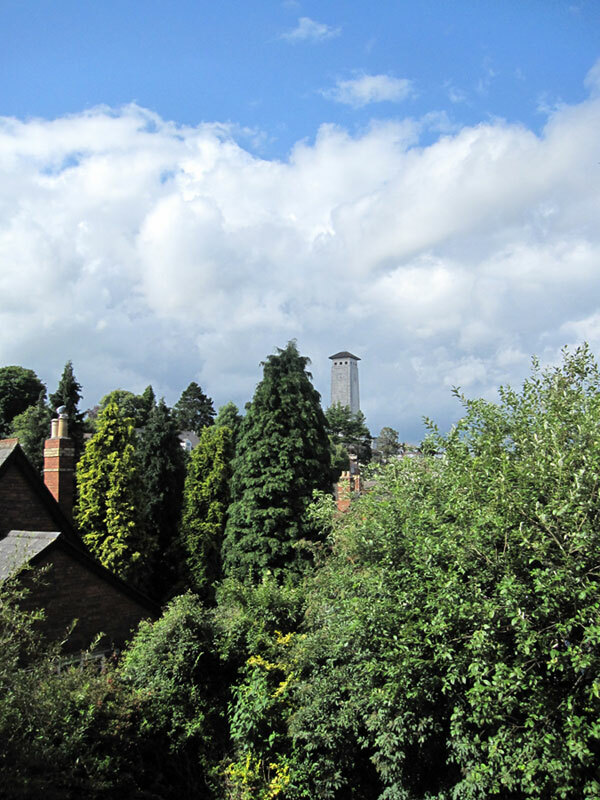 The colours are still proving to be an issue, but as I glanced out at the kitchen window I had an idea looking at the different shades of green from all the trees. They are all different parts, some the same colours as others – lots of different shades but all the same colour. So I sketched out some colour themes in felt tip (as they were at hand) to see if the same principle would work for the character. I think it might as it will also help with the illusion that it is there but not there at the same time when put into the environment I had in mind, jumping across the clouds at dawn and dusk. I then sketched out the story board about lunch time and remembered to take a photo of the white board I had been jotting ideas down onto, as I realised that it would be good to include in the hand in. The overall animatic is still daunting at the moment am not sure how to put it together. Been playing about with Illustrator, Photohsop and ended up settling with Flash due to the timeline making it easier for layout. Have also been reading ‘The Story Board Design Course’ (Giuseppe Cristiano,2007) which I got from the library yesterday last thing. One thing of note so far was to create the animatic in grey scale so as to get idea down, then work from key frames outwards, and that it tends to be similar to the final animation as it’s the template for it. 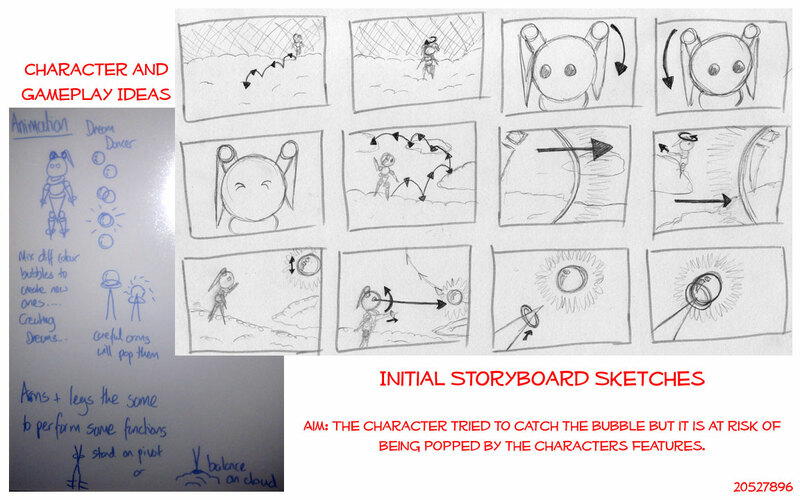 The initial story board and a selection of the design process surrounding it. It is now nearly the next day and I am changing my mind again the more I think about it, I should stick with the character that has already been made and see what I can change, what I can adapt to make it more suitable. So I have roughly sketched out some ideas on paper and the white board as things came to me. Sketching out a redesign for the Dream Dancer character. The idea that has stuck with me the most is to use a combination of the eyes and the horns to convey emotions, the way that the Kiwi would with eyes and perhaps the beak. Using this method will be more challenging, but hopefully it will help convey the message better. For now though I think I should sleep on it as I am feeling a little disheartened as things are not coming together as I had hoped and time as always feels like it is against me.